ANYWAY, so, I'm NOT going to talk about bagels and pizza. Ahem. Or even the fact that sometimes a girl wants some hot apple cider, you know? 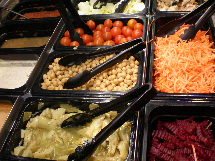 No, I want to talk about salad bars. Now, I know that Whole Foods has a salad bar and swanky Beverly Hills Bristol Farms even has a new one and there's a place in The Water Garden in Santa Monica that rips you off weight-wise just like you're back home. (Actually, if you guess the exact weight, your salad used to be free and my friend Roseanne once succeeded). And I know that salad bars can be questionable for germaphobes and that about a billion LA cafes are famous for their salads, BUT I'm trying to recreate an experience, you know? 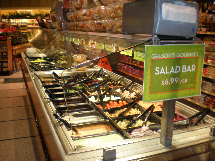 The only salad bar that really brings me back to the Korean groceries of my childhood is the one at Gelson's on Santa Monica Blvd. Actually, to Andrew's mystified chagrin because it's out of the way, Gelson's is also my favorite supermarket overall, but I won't bore you with the details of that (although it is the perfect mixture of swanky and regular). All I'm saying is TRY THE JEWISH COOKIES AND SPICY TUNA ROLLS. That's all I'm saying. Anyway, this salad bar has all the iceberg lettuce, gloppy Italian dressing, macaroni salad and fake krab that one needs to replicate the old school NYC experience. 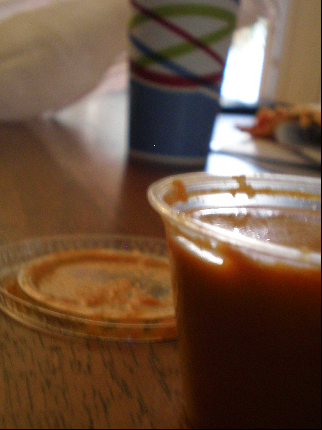 One more issue (and you thought we were done): at NYC Japanese restaurants and even health food spots like Dojo's, carrot ginger dressing flows like water. After years of searching, I have FINALLY found a similar situation in LA! Our neighborhood hosts many of the city's hottest lunch spots from Joan's On Third (we'll talk about their wilted arugula potato salad later) to Toast, but the dressing is found at a lesser visited joint around the corner at 8486 Third Street, which has changed ownership like 85 times in that last two years. It used to be called Chicken and Grill and now, well, I don't even know if it has a name, but it's worthwhile to stop in just for the ginger dressing. Not for the ambience. And now, my very low-end food post is over. Sorry guys. But sometimes I have to vent. P.S. For LA bagels, my father swears by some place called Kosher Land, but I can't confirm until I try them myself.